Have You Thanked A Whistleblower Today? Many companies are only just starting to embrace ethics reporting. They’ve gone through the implementation process with their vendor, if they’ve chosen to use a third-party system. Training employees on the new system has been done. Promotional materials have been handed out. Senior management has endorsed the system and has encouraged employees to report the wrongs they see. No, you’re not walking over to their desk to thank them openly! 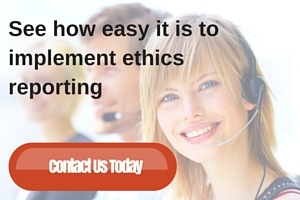 You’re thanking them via the ethics reporting and case management system you’ve just implemented. It allows designated users and whistleblowers to communicate anonymously and confidentially through the system. And the first thing management is going to do is respond to the anonymous reporter and say “thank you for taking the time to report your concern”. Unless you’ve been a whistleblower before, you can’t imagine the stress and uncertainty that’s involved with coming to the decision to report an ethical breach to the company. Simple words to write in this post, but a tremendously stressful reality for the employee. So when they do come forward, thank them. It’s that simple. With those two small words, management has relieved a massive amount of stress and uncertainty from the employee. The employee has just blown the whistle on a fellow employee, or a member of management. They’ve just blown the whistle on an entire department that is going about their business questionably and unethically. It can be a huge decision for some people to come forward. So thank them for coming forward. Not only does thanking a whistleblower relieve them of the stress of coming forward, it also validates the very existence of the reporting system the company has implemented. The reason why it was implemented in the first place – to report wrongdoing anonymously, confidentially, and safely. It also legitimizes management’s implementing, and approval of, the system. It tells employees, ‘We really mean it. Come forward. We will appreciate it, and your effort in doing so.